I've been wanting to try something different and I've been noticing grey hair for about a year now. And last week, I looked at the mirror and said, "Oh my gee!" 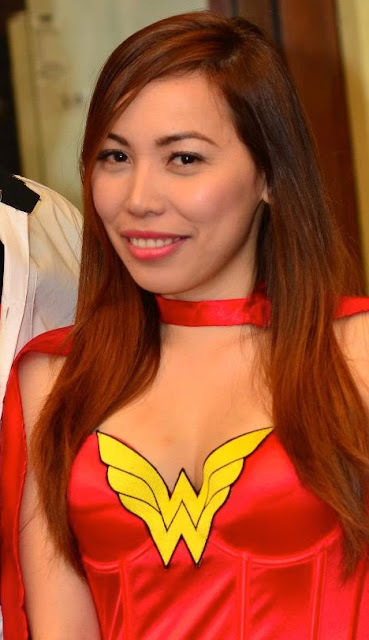 Combine that with an impending birthday plus feeling blah about my hair color, and you've got a recipe for a total hair makeover. For those who don’t know, the hair world borrowed the term 'Ombré' from the french word meaning shaded or shading. Ombré hair is the "trending" hair trend that is generally darker at the roots and then gradually gets lighter as it works towards the ends. It's been spotted on plenty of A-list celebs namely; Jennifer Hudson, Lea Michele, Lauren Conrad, Naomi Campbell, Raven Simone, etc. This Ombré hair is absolute perfection. My peg. Melay, who is one of the senior stylists at Azta Urban Salon Eastwood branch, handled my extremely unruly hair with ease and gave my hair shape and a perfect blend of hair color without taking off too much length, as requested. Like any other Ombre newbie, I asked a lot of ridiculous questions and she happily answered them all. She was confident and knowledgeable in what she was doing, which made me feel at ease. Best of all, she managed to make my mangled mess of hair look like something fabulous from a magazine! At first, I was even a bit nervous because I have never tried anything two-toned but after that, I couldn't stop looking at myself with a beautiful brown to copper blonde ombre! I like the relaxed atmosphere of the salon, and being able to chat while getting your hair done makes the experience much more enjoyable. That being said, I think great service with awesome staff is an important part of the overall salon experience. 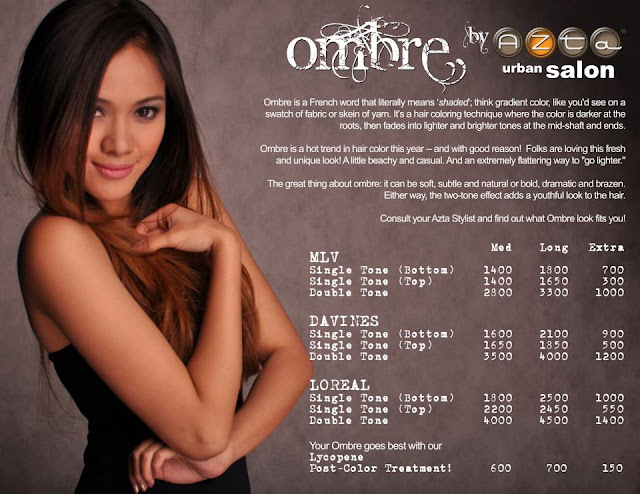 One great thing about Ombre is that it doesn’t require to run to the salon every 8 weeks for a touch-up! Very low maintenance! 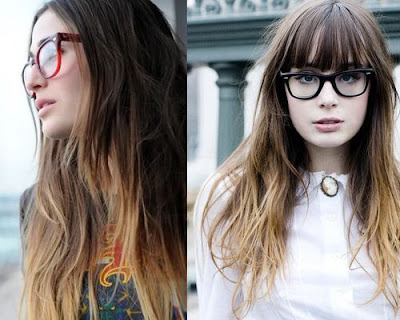 And you can choose your own Ombre look.. soft, subtle and natural versus bold, dramatic and brazen. Either way, the two-tone effect adds a very youthful look! 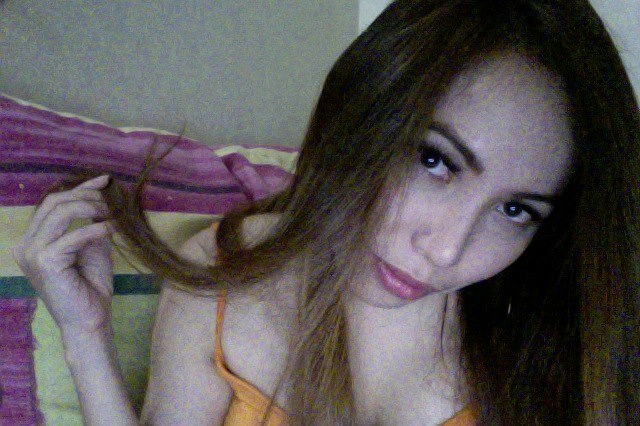 Wanna sport this light brown-to-bleach-blonde Ombre look? 1. Consider your job or profession before you go with the extreme black to bolder shades like blonde, red, pink, and orange. It's recommended to go no more than two shades lighter than your hair color. 2. Choose the correct shades that will compliment your skin tone as well as your wardrobe choices. 3. It may look as if this now infamous look can be DIY'ed and easily achieved at home, BUT if done haphazardly, the effect can create a stark, unappealing contrast. So it is necessary to visit a professional salon and consult a professional hair stylist for the best results. When you go to Azta Urban Salon with the purpose of ombre dyeing your hair, you can be rest assured that your hair is in good hands. For a dark chocolate beauty or black beauty: deep reds, coppers, and cool ash are great choices. For the fair maiden: ash tones, subdued blondes, coppers, golden caramel tones or some lighter and more vibrant shades will add warmth and "freshness" to your skin. 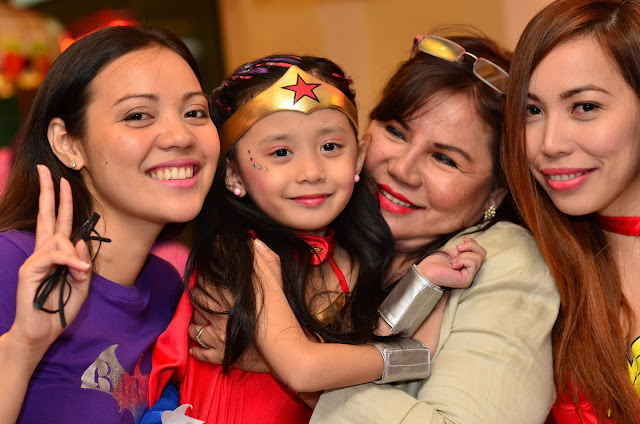 The salon's interior is modern, quaint, cozy, roomy, and very appealing. It's located right smack in the middle of Eastwood City which makes it accessible. They also offer the good perks such as giving complimentary drinks like iced tea. So you sip while you wait and get your hair trimmed. On a side note, I also love the dry shampoo thing, so when you're getting your hair rinsed, you stay drier and are much more comfortable than in the standard lean-your-head-in-the-sink-til-your-neck-hurts. It also saves time and no long queues at the washing station. Nice touch, for sure. 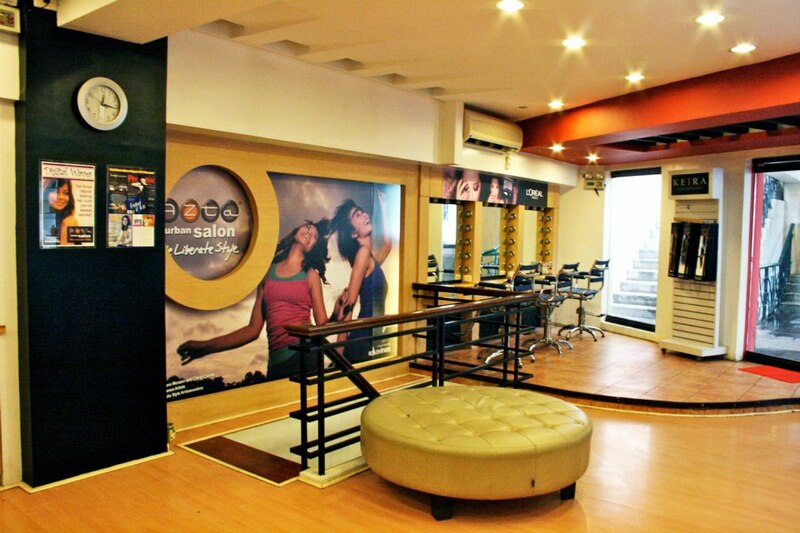 They have a 3-day service assurance policy so your dream of having that perfect summer hair is guaranteed! Prices are very fair, and the quality of work is worth much, much more, considering other salons charge more for less quality. They also have this so-called Salon Prescription specific for your hair. It includes the Do's and Dont's, recommended products to use for maintenance, and when to go back for follow up hair treatment. I also got the post-color Lycopene treatment that is perfectly suited for colored hair. That, as well as Ombre, was a good introduction to the wonderful world of hair dye. Maybe next time I'll go for the red or pink... but for now I'll revel in the (many) compliments. One week after... 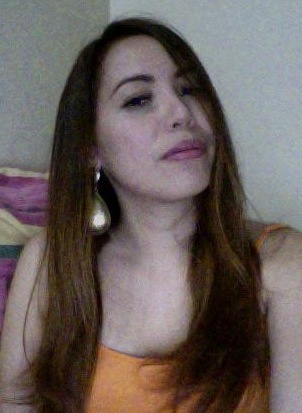 I'm not yet over Ombre and I love how subtle and natural the color is. To sum it all, if I could write just one word about my Ombre experience at Azta Urban Salon, it would be this: amazingfabulousandwonderfulineveryway. I am always hesitant to try new salons because I'm scared of ruining my already ruined hair (LOL) but I finally found a salon worth keeping! And that is at Azta Urban Salon! I was impressed with the entire experience and will definitely be back. No Ifs, ands, or buts about this salon, its a definite 5 stars! So if you're fencing on a new hairstyle and seriously contemplating growing your hair out and trying Ombré, or if ever you're on the prowl for a new trustworthy stylist, I strongly urge you to give this salon a try. Azta Urban Salon is more than just a cool and "astig" name.. Azta Urban Salon totally rocks! What do you think? Yay or nay? Would you like to rock the Ombre look? I’d love to hear your thoughts. 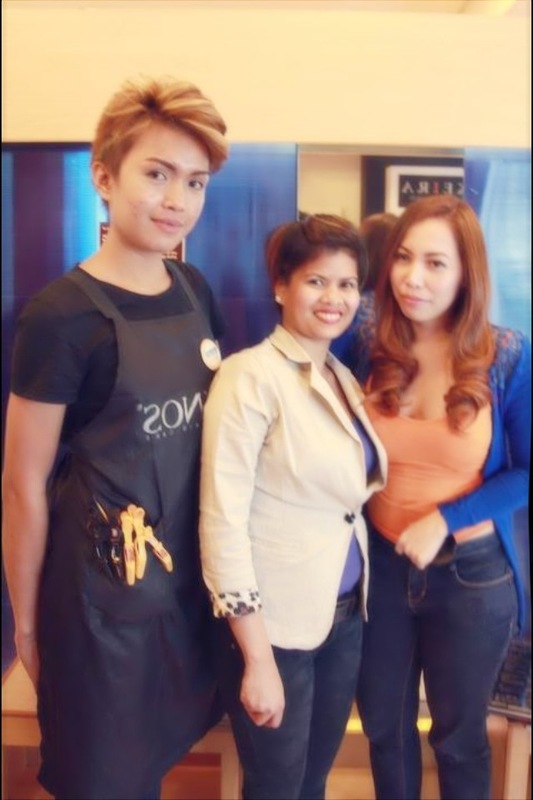 Many thanks to Ms. Meg Lachica of Azta Urban Salon, and to the entire staff of Azta Eastwood branch for accommodating me that afternoon. 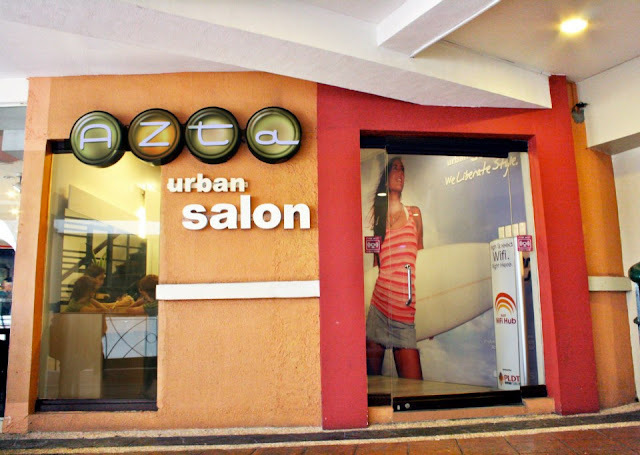 Need to know: Azta Urban Salon Eastwood Branch is at the 2nd level of Eastwood CityWalk, Eastwood City, E. Rodriguez Ave, Quezon City (02) 6876527 More deets on their other branches on this link.